Commonly referred to as marcos, these are the ‘big’ nutrients that provide our bodies with energy in the form of calories. 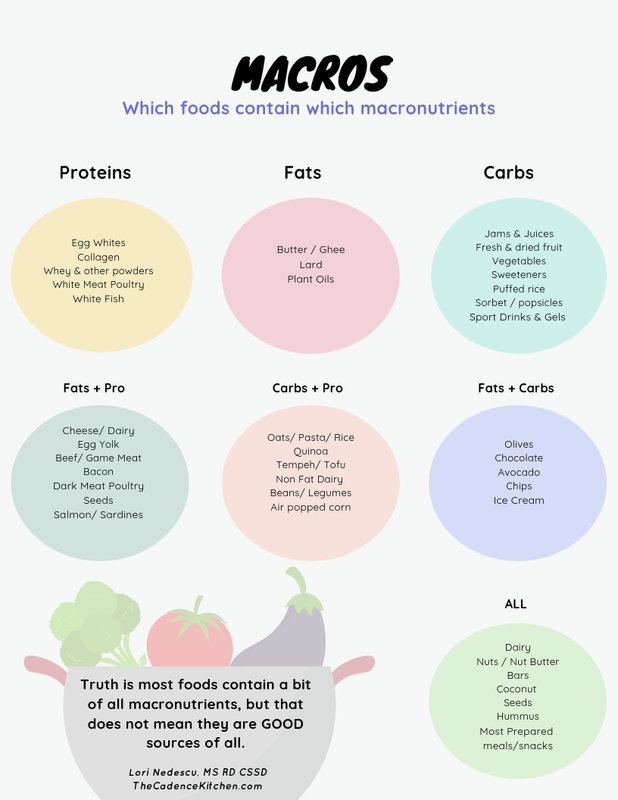 Macronutrients consist of fat, carbohydrate and protein. Alcohol also supplies calories, but without nutrients and without being essential, so it doesn’t really fit in here (although it is important to consider in your overall caloric intake). These 3 big nutrients are the ones that your body relies on to supply the energy needed for your health & performance. While you need all three, how much you need and when you need them are the magic questions. These are the main fuel source for body and brain. Carbohydrates are found in many foods including (not limited to) bread, pasta, oats, rice, milk. yogurt, fruit, vegetables, beans, hummus, and sugar. Carbohydrates supply 4 calories per gram along with fiber, vitamins, minerals, and phytonutrients. For the general public, consuming carbs as a percentage of total intake is sufficient. However, athletes should address carb intake in grams per kilogram of body weight based on hours of training completed; anywhere from 3g -12g/kg (a huge range!). Under consuming carbohydrates put one at risk for fatigue, hormonal imbalances and illness. Manipulating the intake of carbohydrates through loading and restricting of carbohydrates is popular among athletes to play with performance adaptations. Animal proteins provide iron while plant proteins provide fiber but both provide essential and non essential amino acids that are imperative for muscle growth and recovery. Major protein sources are diary, eggs, meat, poultry, fish, beans, legumes, nuts, hemp, pea, tempeh and tofu. This macronutrient (whether from animal or plant), provides 4 calories per gram just like carbohydrates but supplying the same calories per gram is where the similarities end. Proteins are not (at least should not) be used for energy during performance. If the athlete neglects to consume enough carbohydrates and fats, then proteins might be utilized. If this occurs, muscle tissue is broken down (an undesirable effect for most). Protein should be consumed at 10-15% of total calories or roughly 0.8-.1.2g/kg, although certain populations may require more. Consuming branch chain amino acids is an advanced nutrition technique athletes can utilize to increase performance. This macronutrient supplies the most calories of the three, at 9 calories per gram. Sources include avocado, lard, butter, coconut, nuts, plant oils, meat, fish, egg yolks, and diary. Stored fats provide protection for organs, cellular plasticity and absorption of certain vitamins. Fat is used for energy during low intensity activities but is not utilized well for intense bouts of training. Regardless of body composition goals or athletic events, fats should make up roughly 30% of daily intake. There is currently great debate about how fats play into performance and which fats are considered healthful and unhealthful. In short, these three energy providing nutrients are what you need to build your diet around. Regardless of training or goals, it is best to consume macronutrients from a variety of unprocessed, whole food sources. From here, you need to figure out how to make these macros work for you; how much of each and when to consume each. While this might seem simple, it is an incredibly difficult task, however, it is one we will explore in more detail in future posts because figuring out this puzzle for yourself can mean a breakthrough in health, body composition, and performance.